Hackney Colliery Band have announced four summer live dates. The East London contemporary brass collective have lined up shows in Bristol, Birmingham, Nottingham, and Manchester during June, with tickets for the shows on general sale at 10am on April 12. "It's hard to believe that 2019 is our tenth anniversary, but now we’re ten years older it felt like the right time to get back to our jazz roots. It’s been such a privilege to work with so many of our musical inspirations both old and new on this record, and we’re super excited to be ushering in the next ten years with this new collaborative spirit: this is called 'Volume One' for a reason…"
Set for release on June 7, the record finds the band working with a host of key names in jazz and world music including among others Mulatu Astatke, British jazz funk legend James Taylor, trombonist Dennis Rollins, saxophonist Pete Wareham and singer-songwriter and Grammy Award-winner Angélique Kidjo. 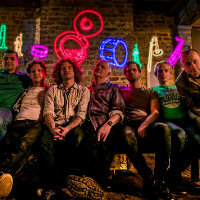 Click here to compare & buy Hackney Colliery Band Tickets at Stereoboard.com. Hackney Colliery Band will play their biggest headline show to date in London next spring.